Makinarium has mainly founded its activity on the development of Special and Visual Effects technique. 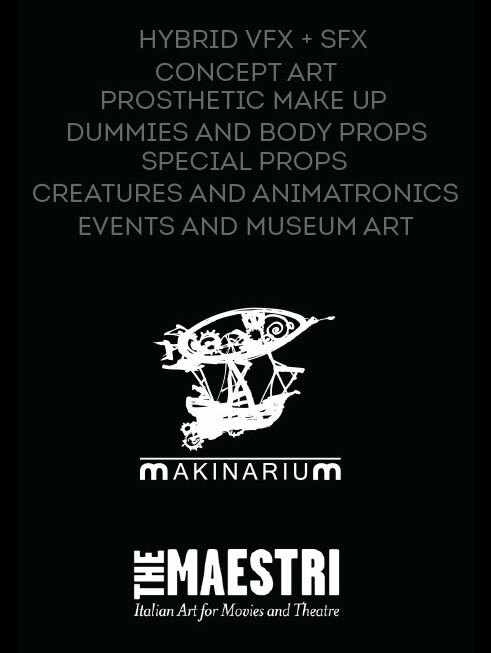 As a Factory, Makinarium brings together under its brand the best of homegrown and European talents, coming from different areas as visual perception, digital post-production, animatronics, mechanical effects, special make-up and hyperrealism. Specialized in the development of integrated physical and visual special effects, Makinarium is enriched by associates and partners, skilled in different sectors as laser scanning, digital video of miniature sets and prototyping of small patented projects of optic and electronic physics; this peculiarity make it one of the most interesting European Visual Effects Factory.